The game is a super-set of Soma Cubes. 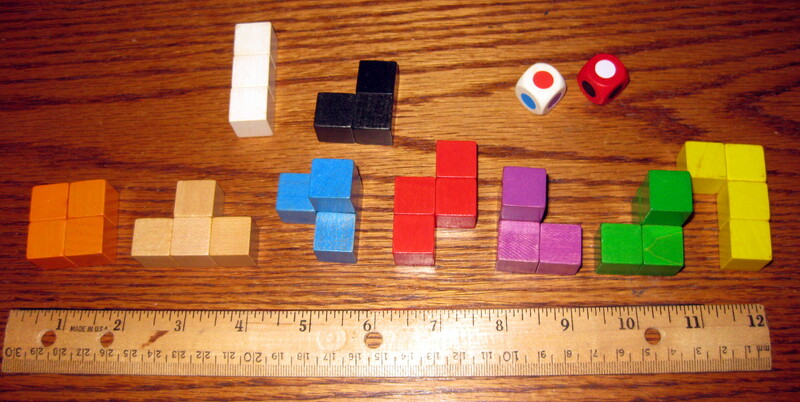 The class of puzzles in general uses a set of figures constructed from unit cubes to build a larger cube (or other target figure), and are mathematically interesting in addition to making good desk toys. 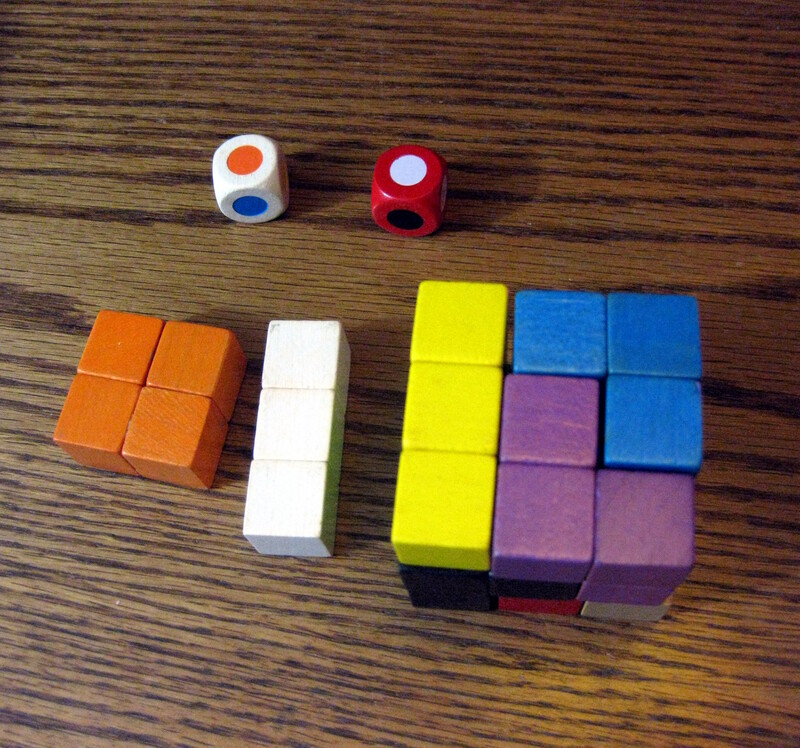 The variant in question adds the two non-convex forms (1×3 and 2×2) to the traditional Soma Cube set, while still only putting seven pieces in play at any time, unlike SOMAplus, which is played with eleven pieces. This combination is apparently sometimes called a Rehm’s Cube Set, but that search term didn’t come up with much. My set was branded “Babylon The Master Builder’s Puzzle Cube” with a design credit to Helmut Huber in the instructions. The designer’s name only turns up a reference to this puzzle in Indiana University’s Jerry Slocum Mechanical Puzzle Collection. The same game has apparently been sold under some other names/brands, including Jumbo also under the Babylon title, but never been all that widely successful. 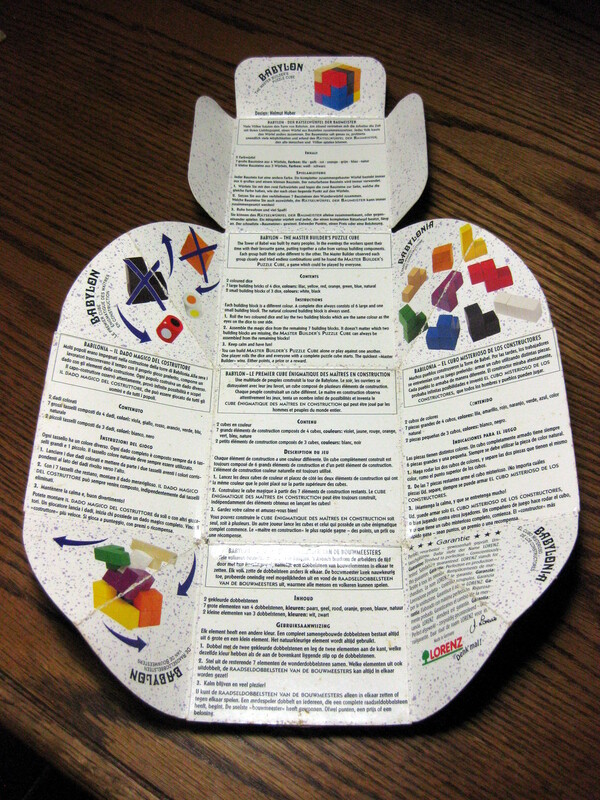 The puzzle comes with the possible two non-isomeric tricubes, and seven of the eight possible tetracubles, excluding the 1×4 form which would never fit into a 3×3 cube, and two cubic dice, one with six differently colored sides matching six of the tetracubes, and one with three black and three white faces. 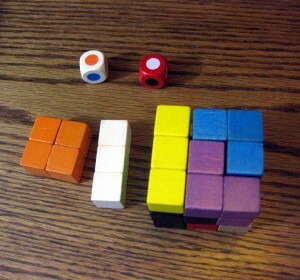 The game/puzzle is conducted by rolling the dice, removing the pieces corresponding to the sides from the set, and then attempting to build a 3×3 cube from the 7 remaining pieces. Detailed English directions in image and transcription below. The tower of Babel was built by many peoples. In the evenings the workers spent their time with their favorite game, putting together a cube from various building components. Each group built their cube different to the other. The master Builder observed each group closely and tried endless combinations until he found the MASTER BUILDER’S PUZZLE CUBE, a game which could be played by everyone. Each building block is a different colour. A complete dice always consist of 6 large and one small building block. The natural coloured building block is always used. 1. Roll the two coloured dice and lay the two building blocks which are the same colour as the eyes on the dice to one side. 2. Assemble the magic dice from the remaining 7 building blocks. It doesn’t matter which two building blocks are missing, the MASTER BUILDER’S PUZZLE CUBE can always be assembled from the remaining blocks! 3. Keep calm and have fun! 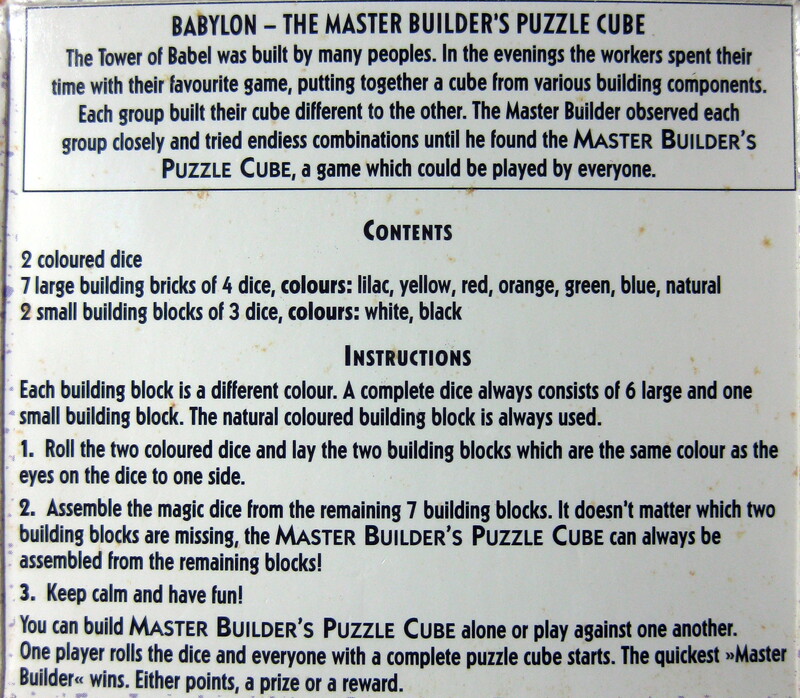 You can build MASTER BUILDER’S PUZZLE CUBE alone or play against one another. 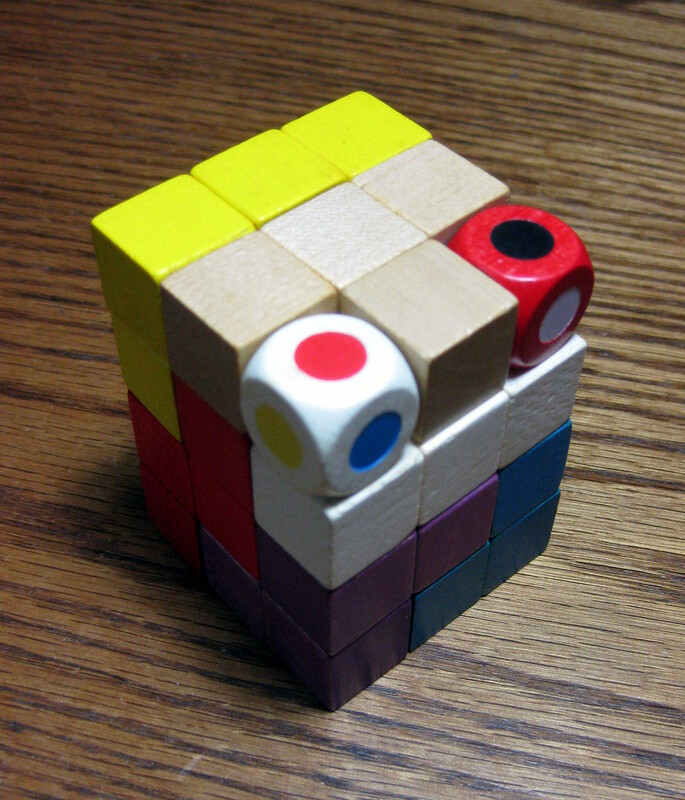 One player rolls the dice and everyone with a complete puzzle cube starts. The quickest “Master Builder” wins. Either points, a prize or a reward. Note that there are 7 tetracube forms and only six sides in the removal die: the “t” shaped piece (natural wood in my set) is always in play – I am not sure if it is generally solvable if that is not the case. A solved puzzle (which happens to be a Soma Cube) looks like the following. Some math/puzzle nerds got excited about this set a couple years ago, but the degree of specificity required to find their archive was such that I only managed to find it after I dug out mine. At the time of this posting there is an Aliexpress seller offering a generic clone of the set, but while it is marked as being only $6.60/ea, they are only sold in pairs, and shipping to the states pushes it up past $40 to get a pair this way. It should be easy enough (as well as significantly cheaper and more satisfying) to build a set from craft cubes or sections of 1x or whatnot. Just for shits and giggles, my set can be arranged exactly as in the seller’s image, which reveals that the color choices are not completely consistent. 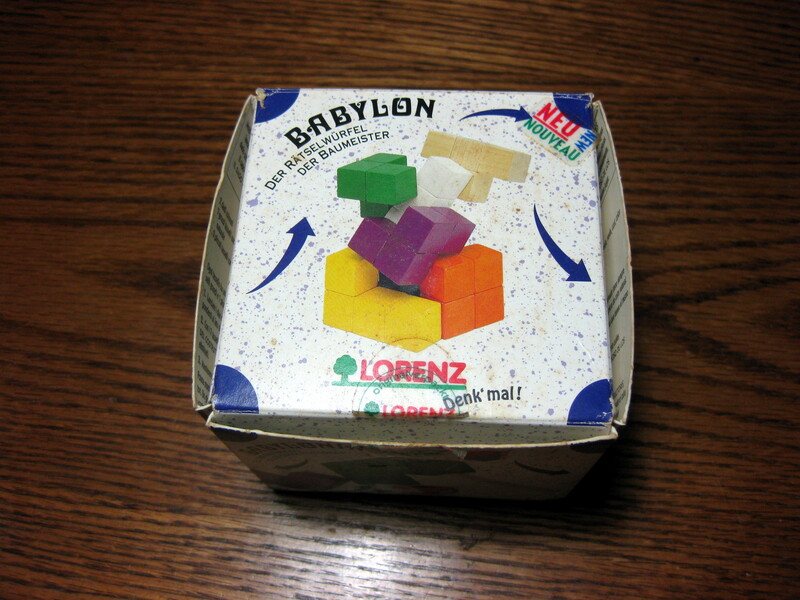 This entry was posted in DIY, Entertainment, General, Objects and tagged Babylon, Soma Cube, Toys. Bookmark the permalink. All the places I knew of to get a commercially made one seem to have disappeared. A couple months ago I built myself some (for redundancy and gifts) from 5/8″ wood cubes (sold as a craft supply) and wood glue. I’ve been meaning to post results on finishes and such – I painted some and dyed others, each has benefits, and neither looks quite like the original. I bought some wooden die blanks to make matching dice but haven’t figured out how to appropriately manage the paint job on them. Hi – Can you send information re where to purchase the puzzle. I have one – it’s great – would like a few more for gifts, etc. I hope to hear from you. In advance, thank you. It looks like there are some floating around the ‘net right now, marked things like “Tetris wooden puzzle cube” for around $15/pc, most of them look like soma cubes (unfortunately, these are the cheaper ones), but a few (like this one for about $15 from some random AliExpress seller, no affiliation) clearly have the extra non-convex pieces and dice. this looks like it might be the same set on Amazon for cheaper, though the pictures make it clear these aren’t as nicely built as the originals. As my other comment says, I ended up buying a bag of wooden cubes, some wood glue, and some finishing supplies, and making a couple sets myself.